We’re being nickled and dimed to death by government…and airlines. First, the airlines charged us for the headphones. Then, they started charging us for use of a pillow and that paper thin blanket. Next, they charge us for a second bag we send through luggage. Then, they charge us if we want a breakfast or lunch or dinner. Yesterday morning, I awoke to news that airlines will begin charging for carry-on bags that we stow in the overhead bins. Now, one airline is mulling over a fee for using the toilet! What next? Making us pay for the recycled cabin air we breathe? (CNN) — Fresh on the heels of one budget airline announcing that it will ask passengers to pay extra to bring carry-on bags on board, another is considering charging them for using the lavatory. Ryanair, which is based in Dublin, Ireland, and bills itself as “Europe’s first and largest low fares airline,” is mulling a plan that would require travelers to pay either 1 euro or 1 British pound (about $1.33 or $1.52) for using the bathroom on flights lasting one hour or less. The plan, titled “Ryanair Cost Saving Proposal,” was published in the airline’s inflight magazine. As part of the plan, the airline is also considering removing two of the three lavatories on some of its planes so it could squeeze in up to six extra seats. The move would help reduce fares by at least 5%, Ryanair said. It’s not the first time the airline has broached the subject of a toilet fee. CEO Michael O’Leary told the BBC in February 2009 that he was considering the charge. How would it fly with passengers? One hint of how Americans might feel about it may come from an informal poll posted on TripAdvisor.com last summer in which one-fifth of the respondents said they would fly on an airline that charged a fee to access the bathroom; 78% said they would not. About 5,300 people answered the online survey question. But the idea may be less shocking to travelers in Europe, where it’s not unusual to pay a small fee to use a public restroom. 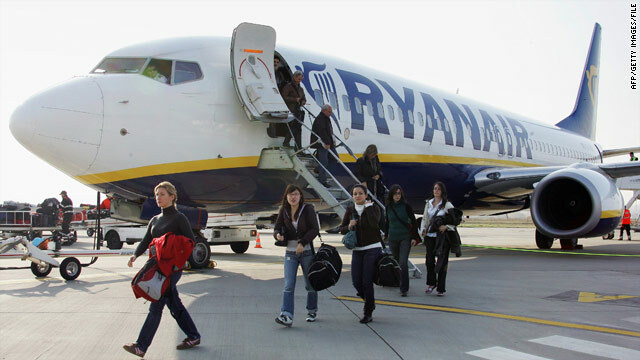 Meanwhile, Ryanair announced Tuesday that it’s raising its checked luggage fee from 15 euros to 20 euros per bag for the peak vacation months of July and August. “Ryanair is determined to incentivise passengers to travel light this summer,” spokesman Stephen McNamara said in a statement. The airline urged its passengers to avoid the fees by bringing carry-on bags only. Ryanair is already well-known for its fees and is up-front about them on its Web site, which details charges for everything from online check-in to traveling with infants. Customers haven’t balked; in fact, Ryanair’s passenger traffic grew 13% last month compared to the same time last year, the airline reported. Low-cost carriers have embraced the concept of a la carte pricing, or keeping base fares at rock bottom levels while charging passengers for any extra services. On Tuesday, Florida-based Spirit Airlines announced that it will charge its customers $20 to $45 for items they place in the overhead bins. Well then, just piss on Ryanair. The solution here is simple. Let government step in and forbid the airlines to charge any fees whatsoever beyond the ticket price. Not just hte US,but any country in the world! Hospitals will start doing this due to healthcare reform. I say you just carry a “Little John”! LOl – Yeah, try getting that through those stoopid TSA Gomers.